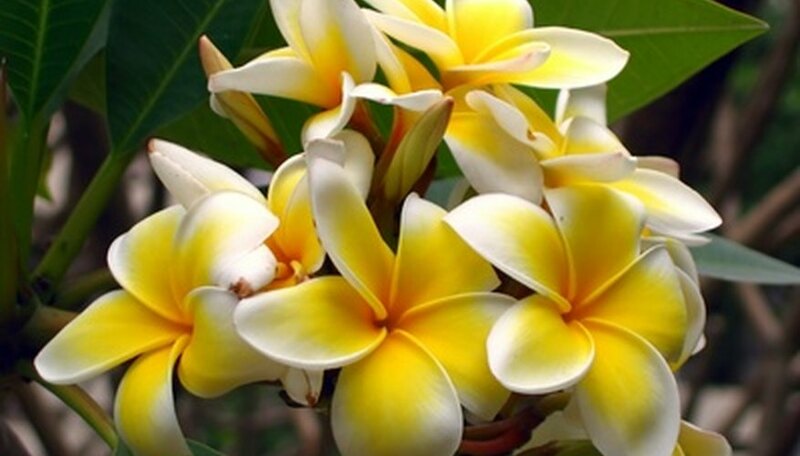 Gardeners in hot climates grow tropical flowers that gardeners in other areas can use only as container or house plants. Plants for a hot climate stand up to all the heat Mother Nature throws at them and come back for more; their flowers bloom more profusely the more sun they get. Abyssinian banana (Ensete ventricosum) is also known as Ethiopian banana and ensete. While the plant resembles the traditional banana, it does not produce an edible fruit. The trunk alone reaches a height of up 30 feet with olive-green, paddle-shaped leaves up to 20 feet long and 3 to 5 feet wide growing out of the top. In most cases, the trunk will be shorter and the overall height of the plant will be just slightly more than the length of the leaves. The plant produces white cup-shaped flowers inside 3- to 4-foot-long hanging clusters of red modified leaves. Plant Abyssinian banana in full sun to partial shade and in moist and well-drained. The plant is hardy in United States Department of Agriculture (USDA) hardiness zones 9 to 11. Yellow elder (Tecoma stans) is also known as trumpetbush, yellowbells, ginger-thomas and tronadora.This plant is a shrub or small tree that is hardy in USDA zones 7 to 11. The tree is native to Central and South America and grows to a height of 25 feet. Oval-shaped, pointed leaves are made up of from 1 to 9 leaflets, each 2 to 3 inches long. Yellow trumpet-shaped flowers measure 1 to 2 inches long and grow in clusters in the forks and at the tips of the branches. The flowers are followed by seed pods that resemble string beans, which grow from 4 to 8 inches long and hang in vertical clusters. Plant yellow elder in full sun and a moist, well-drained soil. Pagoda flower (Clerodendrum paniculatum) is an evergreen shrub that grows from 3 to 5 feet tall and 2 to 3 feet wide. The plant produces heart-shaped leaves up to 12 inches across and tiny funnel-shaped flowers that grow in clusters up to 12 inches long at the tips of the branches from summer through autumn. Plant pagoda flowers in full sun and moist soil. The plant is hardy in USDA zones 8 to 11. Pineapple sage (Salvia elegans) gets it name from the leaves. Crush one and you get the distinctive odor of pineapple. The plant grows from 3 to 5 feet tall and 2 to 3 feet wide. Light green, fuzzy leaves grow from 2 to 4 inches long. Ruby red, tube-shaped flowers grow from 1 to 2 inches long in 8-inch-long clusters of four. Pineapple sage plants like full sun and moist soil, and are hardy in USDA zones 9 to 11.